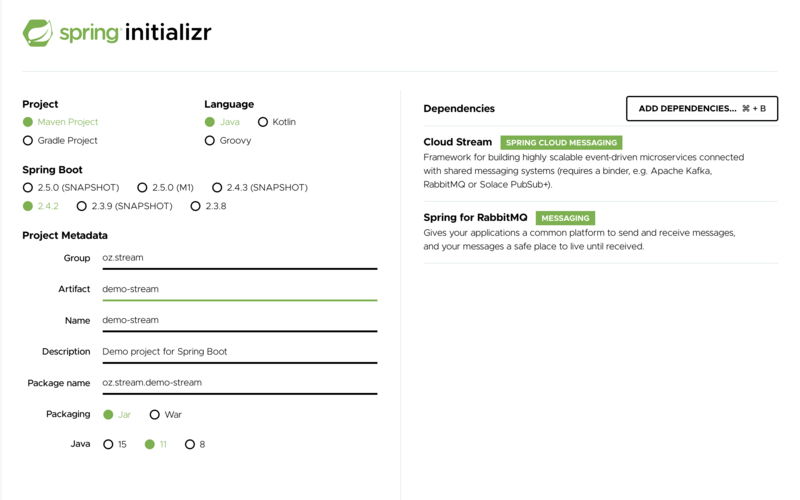 Want to be notified of new releases in spring-cloud/spring-cloud-stream? * Build, test, iterate, and deploy data-centric applications in isolation. * Apply modern microservices architecture patterns, including composition through messaging. * Decouple application responsibilities with event-centric thinking. An event can represent something that has happened in time, to which the downstream consumer applications can react without knowing where it originated or the producer’s identity. * Port the business logic onto message brokers (such as RabbitMQ, Apache Kafka, Amazon Kinesis). * Interoperate between channel-based and non-channel-based application binding scenarios to support stateless and stateful computations by using Project Reactor’s Flux and Kafka Streams APIs. * Rely on the framework’s automatic content-type support for common use-cases. Extending to different data conversion types is possible. --- [ main] o.s.a.r.c.CachingConnectionFactory       : Created new connection: rabbitConnectionFactory#2a3a299:0/SimpleConnection@66c83fc8. . . The spring-cloud-stream-reactive module is deprecated in favor of native support via Spring Cloud Function programming model. Notes on migrating from 1.x to 2.x? Introduction of @StreamRetryTemplate qualifier. While configuring custom instance of the RetryTemplate and to avoid conflicts you must qualify the instance of such RetryTemplate with this qualifier. See Retry Template for more details. To build the source you will need to install JDK 1.8. The build uses the Maven wrapper so you don’t have to install a specific version of Maven. To enable the tests for Redis, Rabbit, and Kafka bindings you should have those servers running before building. See below for more information on running the servers. There is a "full" profile that will generate documentation.